Today was free Slurpee day at 7-11, so the kids and I joined the fun! 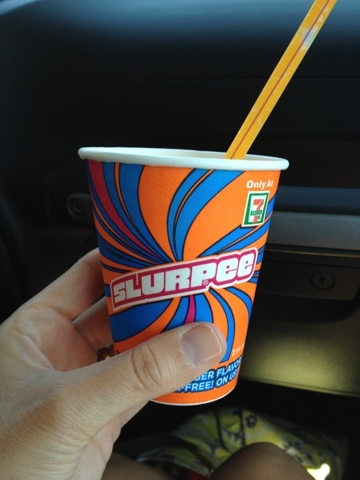 From 11am-7pm ... 7.11 ounce Slurpees were free! That was a mouth-full huh? 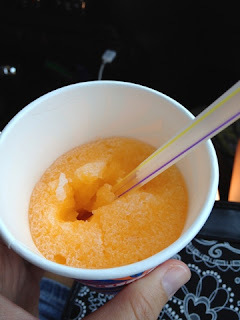 A brand new 7-11 just opened near our house last Friday so the Slurpee treats were so convenient. I got the new Mango lite flavor. It was really good and so refreshing on this hot day. We always make a big deal about seeing 7-11 convenience stores since Layla was born. Her birthday is July 11th. It seems like lately there are tons of 7-11's springing up in our area. Layla and Hayden love seeing them! The kids each got cherry flavored Slurpees and they loved them! I see many more Slurpees in our future coming up this summer. We also have a snow-cone stand nearby. They will be seeing our smiling faces all summer long! No free slurpee for us. With the price of gas it's much much cheaper to get a $1 icee at the Valero than drive an hour to the nearest 7-11. We don't have 7-11's near us. Bummer. Racetrac has Dr. Pepper Icee's though! They're amazing. Although, I haven't had one in like a year.